According to a survey conducted by the Internet Home Alliance 33% of homeowners watch TV in the kitchen. 43% of respondants want to watch TV in their ideal kitchen. 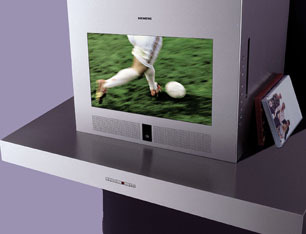 Siemans has come up with a new way to incoporate a TV and DVD player into the kitchen without sacrificing storage or work space. Their 36″ avantGarde® multiMedia Hood incorporates a 17″ LCD with a sleek vent hood. The 600 CFM fan is quiet (54 dB) so you won’t miss any of the action from your favorite program. Unfortuantely, the 51% of homeowners planning to include a TV in their kitchen remodel this year will have to make other plans for watching TV since the hood won’t be available until 2008.